Chris Cline is the majority owner of the private firm Foresight Reserves, LP, which owns or controls more than three billion tons of coal reserves in the Illinois and Northern Appalachian coal basins..Cline also owns The Cline Group, a parent company to Hillsboro Energy and Gogebic Taconite. In his online biography, Cline describes himself, "[Cline] has developed and operated over 25 coal mining, processing and transportation facilities in the Appalachian Region and the Illinois Basin, including some of the most productive long wall mining operations in the country. Today, Mr. Cline controls more than three billion tons of coal reserves in Illinois and Central Appalachia." As of March 2013, Clines net worth is listed at $1.2 billion. 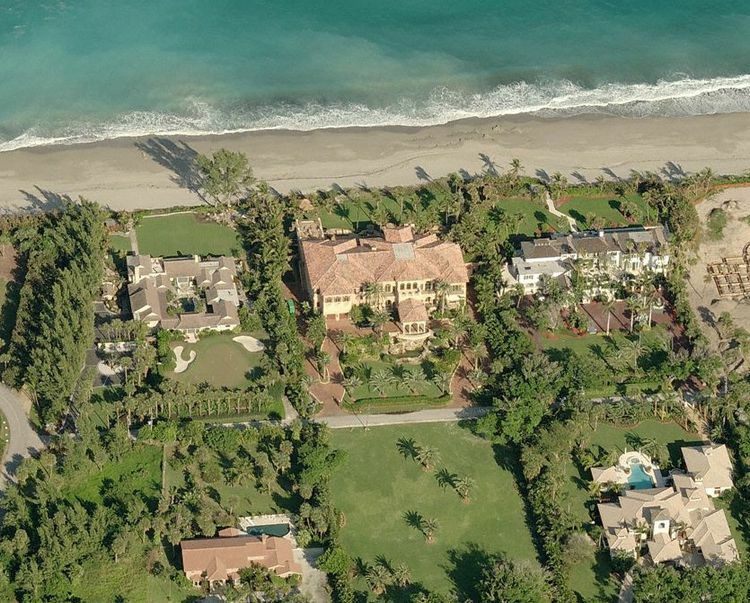 Chris Cline's 33,413-square foot house in Palm Beach, Florida. Cline's operations and lifestyle were profiled by Bloomberg Magazine in the October, 2010, article "New King Coal." The article discusses how Cline tried to distribute literature at his childrens' school suggesting that climate change may be caused by clusters of sunspots or the Earth wobbling on its axis, not just carbon. When the school refused due to lack of scientific support for these theories, he complained to school fundraisers. He calls coal "a moral imperative" for the world's poor, and describes Massey Energy's Don Blankenship, CEO during the Upper Big Branch Mine Disaster, as one of the coal industry’s "most talented leaders." Cline told Bloomberg reporters John Lippert and Mario Parker that "we in the industry probably do the worst job in the world getting out the story of the good lives we're helping people live. Changing that is certainly a big interest of mine." "As far as the social acceptability of coal, I like to think I'm part of supplying the cheapest energy in America," he said. In 2009, ExxonMobil sold the Shay Mine No. 1 to Macoupin Energy LLC, part of the Cline Group, also owned by Chris Cline. The Cline Group also owns Hillsboro Energy and has mines elsewhere in Illinois and West Virginia. Riverstone Associates - This Carlyle Group affiliate invested $600 million in Cline's operations in 2007. In April 2011, the Cline Group began digging at the Deer Run Mine in Illinois. The early production is “development coal” that must be removed to allow construction of the underground mine. The mine remains the subject of a 2-year-old appeal of its operating permit. The appeal was filed by a group of landowners called Citizens Against Longwall Mining in early 2009, who contend the longwall mining method to be used at Deer Run will hurt farmland values, filing the appeal after the Illinois Department of Natural Resources approved an operating permit for Deer Run mine. The group argues that longwall mining will damage farmland by causing long-term mine subsidence. Brian Perbix of the Prairie Rivers Network/Sierra Club said opponents are hoping for a decision this summer 2011, and added that there is still time to halt the operation. Department of Natural Resources spokeswoman Januri Smith said the administrative review remains in the discovery process and that a timeline has not been set for a ruling. From 2008 to 2013, companies of Cline contributed thousands of dollars in campaign contributions to Tony Mayville, who served as acting director of Mines and Minerals at the Illinois Department of Natural Resources. Contributions were made while Cline was seeking mining permits; Mayville was already collecting coal industry campaign contributions when Illinois Governor Pat Quinn made him acting director of the Office of Mines and Minerals, where he would oversee the mine permitting process. "Walker received $10,000 for his gubernatorial campaign, $8,000 directly from Cline and $2,000 from one of Cline's fellow mining executives. "Cline and his cohorts donated another $29,750, split between two Assembly candidates and one Senate candidate. Many suspect that Gogebic Taconite actually wrote the bill that is currently before the legislature." Gogebic Taconite also executed its own economic analysis reporting that its project would create 700 mining jobs in Wisconsin. ↑ Harriet Rowen,Wisconsin GOP Attempts to Ram Through Special Interest Mining Bill, PR Watch, February 22, 2012. ↑ Chris Cline Biography, Personal website, accessed May 31st, 2013. ↑ The World's Billionaires, Forbes, March 2013. ↑ 5.0 5.1 5.2 John Lippert and Mario Parker, "New King Coal," Bloomberg Markets Magazine, October 12, 2010. ↑ John L. Lewis, "ExxonMobil sells Monterey coal mine – Will new owners keep the Union?" Union News, January 27, 2009. ↑ 17.0 17.1 17.2 Harriet Rowen,Wisconsin GOP Attempts to Ram Through Special Interest Mining Bill, PR Watch, February 22, 2012. ↑ Tim Landis, "Deer Run producing 'development coal'" State Journal Register, Apr 26, 2011. ↑ Will Reynolds, "Illinois Mine Safety Head Took Thousands in Campaign Contributions from Coal Baron Chris Cline," Ecowatch, February 8, 2014. This page was last edited on 11 October 2017, at 19:15.